Steel is the metal alloy produced from iron (Fe) when the Carbon (C) content is < 2%. Iron ore is an abundant natural resource found in concentrations up to 70% purity. The recipe for steel also includes smelted iron, limestone and coke to create new “primary” steel. The basic oxygen furnace (BOF) remains the primary mill “technology” that produces over 60% of the World’s steel supply. At the end of it’s useful life, steel is collected, reduced to scrap, remelted, cast and rolled into new products thanks to the lower energy requirements of the electric-arc furnace (EAF) that can use 100% steel scrap or highly concentrated direct-reduced-iron (DRI). 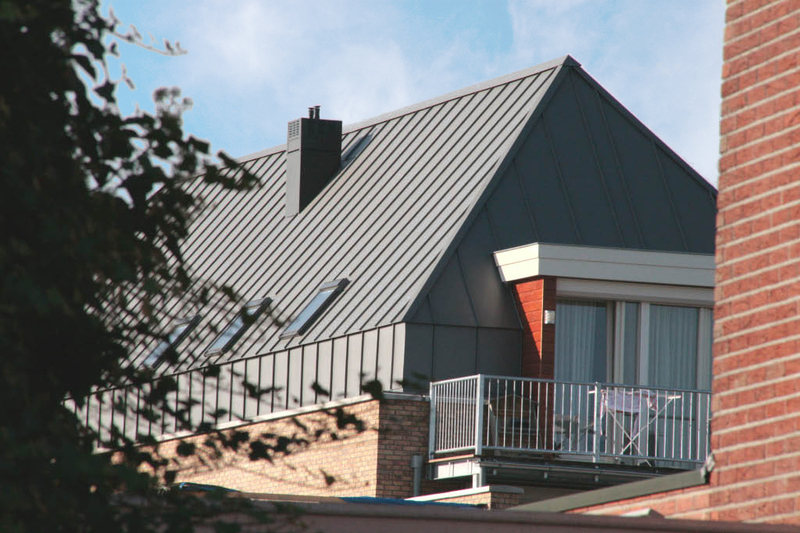 The best metal roof, facade, gutter, flashing & trim applications deserve the highest quality metal: copper, zinc, & stainless steel for the appropriate applications create long-term solutions. But if the initial cost, carbon footprint or limited color selection is an issue, color-coated steel may be your best material choice. Custom low-yield “foldable” steel similar to EDDS (Grade 23). Ideal for DLSS/ mechanical-lock roofing panels & where superior “crafted” roofing details are required (*see below). Structural Grade Grade 40 & Gr50 are popular for snap-seam/ snap-lock standing-seam profiles and structural standing-seam profiles spanning open framing. Structural Grade 80 for very thin steel thickness (28 ga. or less), added stiffness or for dent resistance. Why Nordic-quality Steel from SSAB? Product specific EPD from SSAB: download the GreenCoat EPD. * foldable steel bridges the gap between the natural metals that are very malleable and tradition mild carbon-steel that is better suited for snap-seam panels applications rather than architectural double-lock standing seam profiles (1″ & 1.5″ seam heights). A softer steel with virtually no “spring back”, GreenCoat PLX Pro BT allows better seam folding and crafted detail execution that helps the installer create a higher quality steel roof and reduced demand for sealant. In addition, all PLX foldable steel also has a heavy G115 galvanizing layer for added protection below the paint.